JoAnn Gonzalez Hickey has spent much of her adult life engaged in the visual arts as practitioner, patron, friend and advocate. While amassing a considerable portfolio of contemporary art through the years, she never considered herself a collector. Employing no formal approach, she merely purchased work as interests, opportunities, life circumstances, and space allowed. Living with contemporary art was the essential. Upon abandoning the art studio and any potential advancement as a young practicing artist, her mentor and teacher wisely advised her to continue on by “enjoying an art experience every day”. Reading, museums, galleries, studio visits, board work and philanthropic engagements became the artistic playground where her eye and individual sensibilities continued to develop. 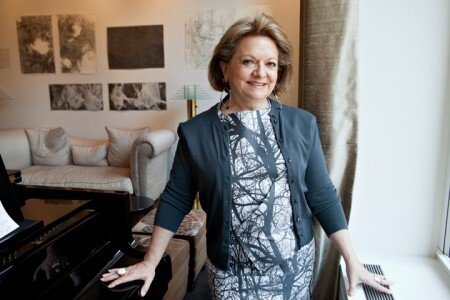 A move to New York City in 2002 prompted JoAnn to think more formally about collecting. Certainly living in New York City, a major international center for contemporary art, offered opportunities for a direct and targeted exploration. She spent the next couple of years visiting private collections, seeking perspective on the various approaches employed by collectors. During this period of time she realized her eye was most often drawn to works on paper. In 2005, having gained clarity and vision, she set out to formally build a collection focused entirely on unique contemporary abstract works on paper. The collection has expanded considerably in it's 14 year history. It offers the fullest expression of what a drawing can be while articulating the range of language employed by individual artists. JoAnn Gonzalez Hickey believes there is value in connecting with the artist in order to gain an understanding of the underlying forces central to the artist’s work. It is here she derives great pleasure as avenues of subconscious memory open to reveal shared associations.